Have you ever felt a lumpy bump under your pets skin? Your first reaction might be panic, does my dog have a tumorous cancer? The most common cause are Lipomas, which are a benign tumor, often referred to as a fatty tumor. They are more common in overweight female dogs and certain breeds are more likely to develop them including: Doberman Pinschers, Schnauzers (miniatures), and Labrador Retrievers. The fatty tumors usually show up on the torso, neck, upper legs and armpits. It's a way for the body to get rid of toxins when the body cannot eliminate them through other ways such as the kidneys, livers and intestines. 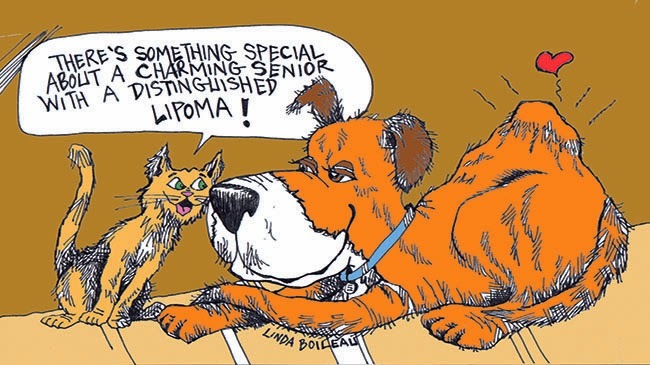 The first step is to visit your veterinarian to make sure it is a Lipoma and not something more serious. Often a fine needle aspiration or biopsy will be done to confirm that it is a Lipoma. Your veterinarian will work with you to monitor the size and determine if surgical removal is needed. Holistic care can help lipomas. Omega 3s such as Amazing Omegas, and liver support supplements can help your pet eliminate toxins and help prevent another fatty tumor. Many times the fatty tumor is developing due to a lack of essential fatty acids (good Omega 3) in the diet.